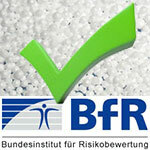 The German Federal Institute for Risk Assessment (BfR) has researched the question whether dermal absorption or unintentional oral ingestion of PE microplastic particles from cosmetic products pose a health risk. The experts conclude that the use of cosmetic products containing PE microplastic particles does not pose a health risk to consumers. Some cosmetic products such as peelings, shower gels and toothpastes are promoted as having an especially gentle cleansing effect on the skin or teeth. For this purpose, such products may contain microplastic particles which usually consist of polyethylene (PE) and are between 0.1 and 1 millimetre (mm) in size. Microplastic particles used in peelings and shower gels are larger than 1 micrometre (equates to 0.001 millimetre). Given this particle size, it is not to be expected that foreseeable use of the products leads to absorption via healthy and undamaged skin. Microplastic particles from toothpaste can inadvertently be swallowed and thus ingested orally. Due to their molecular size, it is not to be assumed that the particles are absorbed via the gastrointestinal tract. Instead, they are much more likely to be excreted with the faeces. It is unlikely that during their passage through the gastrointestinal tract toxicologically relevant amounts of ethylene are released from the microplastic particles. Based on the current state of knowledge, the BfR therefore concludes that the use of cosmetic products containing PE microplastic particles does not pose a health risk to consumers. It is to be noted that in the conclusions of its assessment, the BfR has only taken into account the risk for human health, and not the environmental consequences of the discharge of these microplastic particles into natural, especially aquatic environments. And yet, it is this aspect that is the most controversial. • See the full version of the BfR opinion (only available in German) .